Gigging and touring involve a ton of downtime, mostly during the hours between load-in and the actual performance. 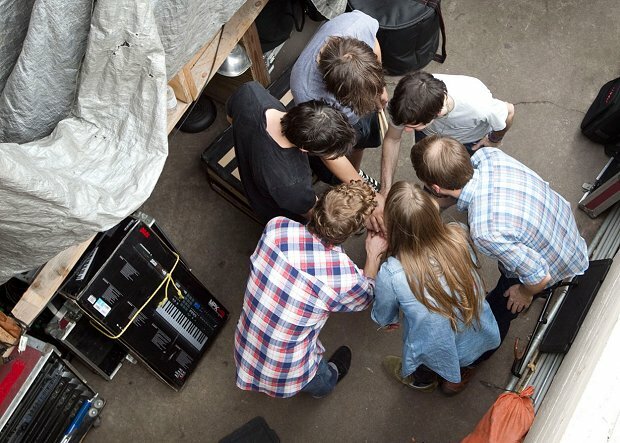 So naturally, musicians tend to fill the time with various rituals that they repeat every gig prior to heading onstage. While some rituals may be based on pure superstition or only relevant to one particular artist, there are a few things that all musicians can (and should) do before their set in order to play their best. Here are my top four recommended activities to include in every pre-show ritual. Along with getting those performance muscles moving before you hit the stage, warming up allows you to play at 100 percent capacity right from the first note. Don’t be that person who thinks it's acceptable to warm up onstage and end up playing mediocre for the first few songs. There’s also a chance that, after skipping your warm-up enough times, you could end up causing yourself serious pain in the long run. Mobile technology makes warming up easier than ever. You don’t even need to own a metronome anymore – just download one for free on your phone. It’s not too difficult to grab some headphones and run through some slow scales for 10 minutes at some point before you head onstage, and doing so will make your experience much more positive. If you struggle with any kind of stage fright or performance anxiety, meditating backstage can help alleviate this greatly. Stepping onstage relaxed, warmed up, and ready to play definitely helps you feel more confident – and when you feel confident, you play better. I love to just sit in a secluded area with headphones, close my eyes, and listen to the songs I’m going to play at the gig. This never fails to get me loosened up. Including a little meditation of some kind with a short warm-up and some tea or water is a quick and painless way to help you play at the top of your game. Pretty much anyone who's sung onstage can recall times where they’ve forgotten lyrics, even when they’ve been extensively rehearsed. If you're singing some or all of the songs for the gig, take some time before your set to write out the lyrics by hand. Writing things by hand solidifies them in the mind better than anything else, and taking a little extra time before you go on to write out your lyrics will significantly lower the chance of a disaster later. This is a great tool for not just vocalists, but everybody in the band. Knowing the lyrics to each of the songs you play helps you become intimately familiar with the form of each piece and navigate from part to part, while hopefully cleaning up any confusion about transitions. Again, small details in certain songs have the tendency to fly out the window while onstage, regardless of how well they're rehearsed. Take the time to make things 200 percent solid in your mind! At a gig, you’re potentially in a room filled with other bands, their fans, your fans, venue staff, promoters, photographers, and writers. Take advantage of that! Making friends with other people involved in the music industry is vital to your career, as you'll often receive the best opportunities through your friends. Whether it's a great gig or tour offer from another band or artist, a chance to get a great timeslot from a promoter or somebody that works at a venue, or consistent press coverage from a journalist, you have a valuable opportunity to meet and talk to these people face-to-face before your set. Even if nobody turns up to your gig (which will happen from time to time), hop onto a mobile device and do some e-networking. Interact with fans over social media, look up some new local bands that you'd like to play with, or find some new press contacts to reach out to for later shows. With all the downtime you'll probably have prior to your set, you might as well make it productive!